If it happens in business aviation it is covered by Aviation International News. With an unwavering focus on quality content and unmatched distribution, this loyal audience is comprised of the buyers and influencers that you need to reach. 38,000 qualified subscribers in 155 countries. Primary audience of global turbine aircraft operators. 90% audited 1-year request rate - the highest in our competitive set. Geographic readership matches the global distribution of business aviation aircraft. 75% of audience reads over half of every issue. 100% of top U.S.-based Part 135 receive Aviation International News. 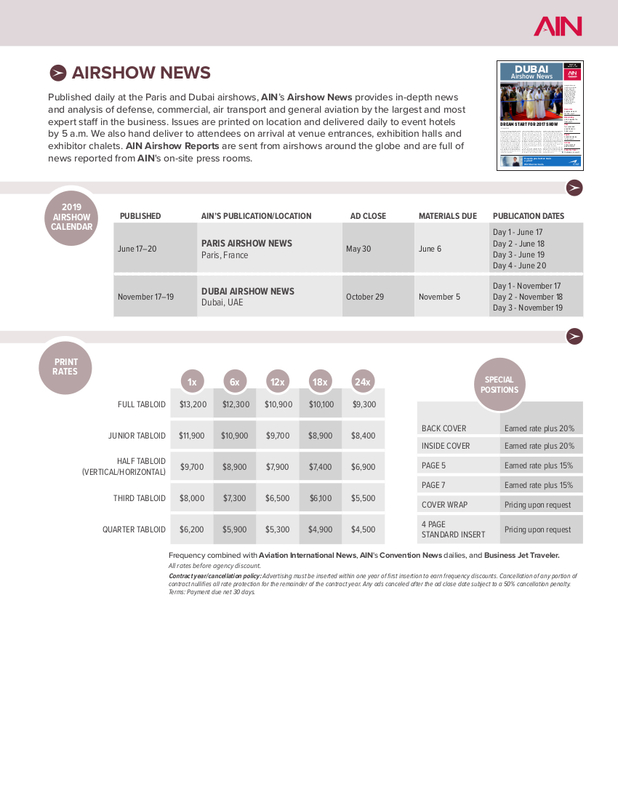 Find rates, specs and the editorial calendar in our Media Kit. The world’s most-relied-upon business aviation enewsletter is delivered direct to inboxes four times per week (Monday-Thursday), Custom written content specifically for the mobile inbox provides unparalleled access and attention to your message. 60% of traffic from mobile. Large “billboard” ad units optimized for mobile. Limited sponsors for maximum exposure. 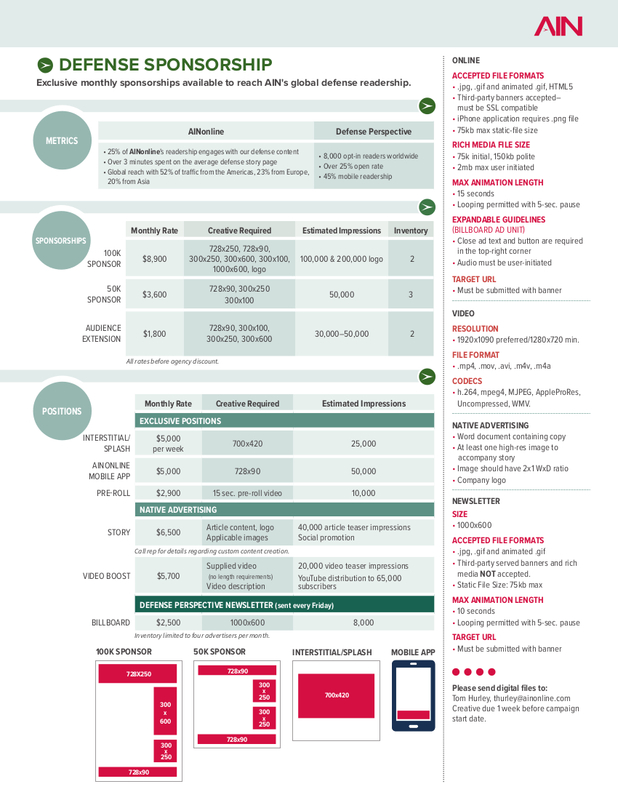 Find rates and specs in our Media Kit or review our readership and ad performance. Daily updates from the business aviation industry are provided every day at AINonline.com. Targeted web banners and native advertising reach a mix of regular and search traffic from around the world. 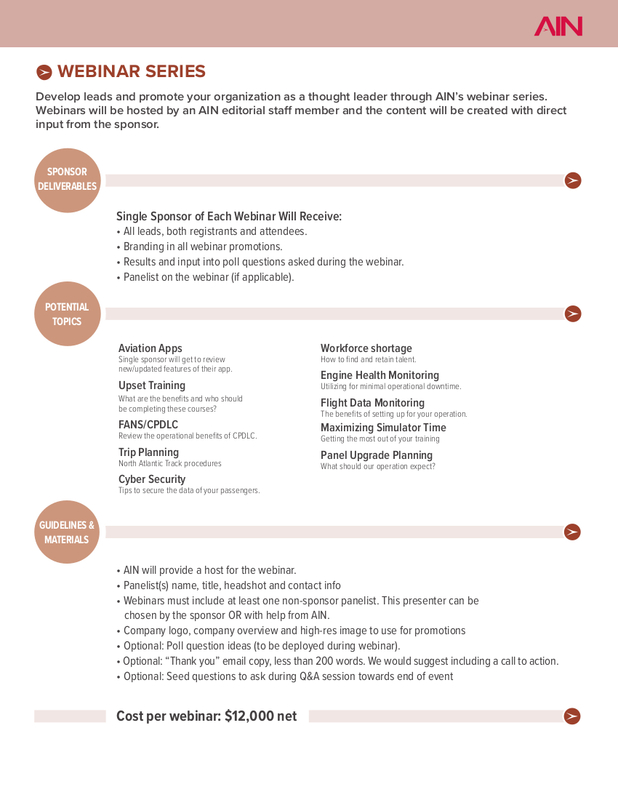 Video and rich media sponsorship opportunities present digital branding opportunities. Over 3 minutes per reader spent on the average business aviation story. 55% of traffic from United States. 8mln views per year from over 100 published videos. 4,000 stories published per year. Or reach our regular audience on the AINonline iOS and Android app with over 40,000 page views per month and an average click-through-rate of over 1%. 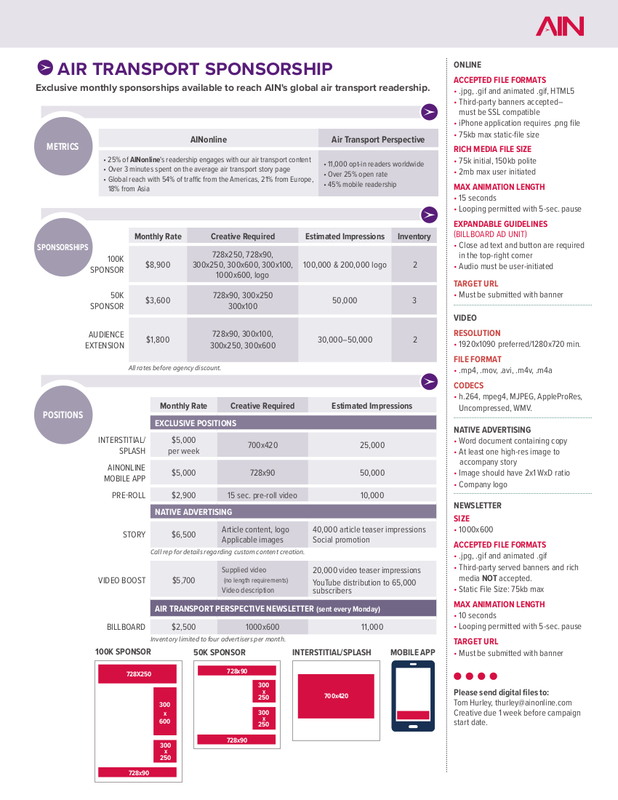 Find all rates, specs and positions in our Media Kit or view our readership and ad performance. Don’t just attend, stand out. 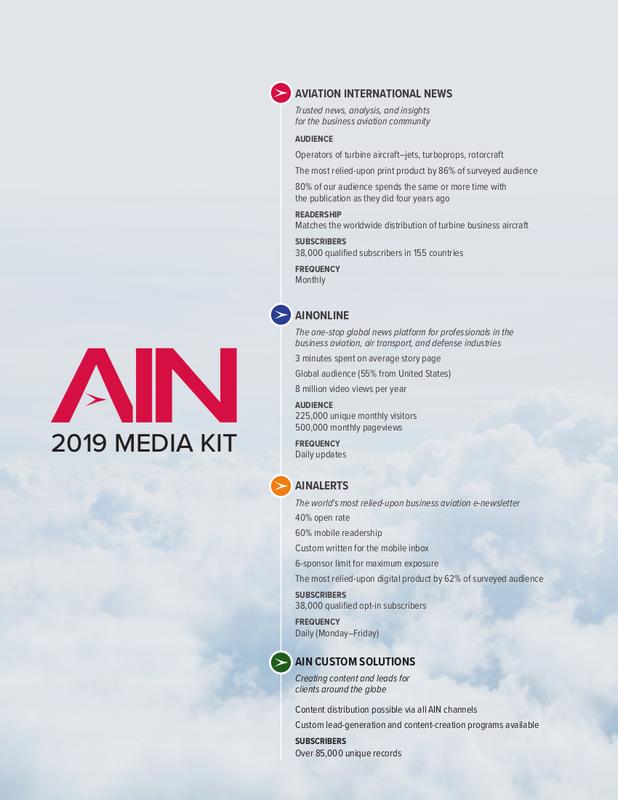 Published at world’s premier business aviation and rotorcraft conventions, AIN’s Convention News is the go to source of trade-show attendees for breaking news and product announcements. Unmatched early morning distribution at all event hotels, transportation centers and convention entrances. Regularly produced video content from each show distributed at AINonline, YouTube and via social media. Find our recent coverage here. *2017 EBACE Intercept Study. Full results here. HAI Convention News - Heli-Expo - U.S.A.
NBAA Convention News - NBAA - U.S.A. The world’s largest airshows deserve the world’s best coverage. At the largest aerospace events around the globe you will find AIN’s top editors covering the latest news, product announcements and orders. Trade-show attendees know to reach for AIN’s Airshow News for reliable and thoroughly researched content. Make sure they find your company’s message inside as well. 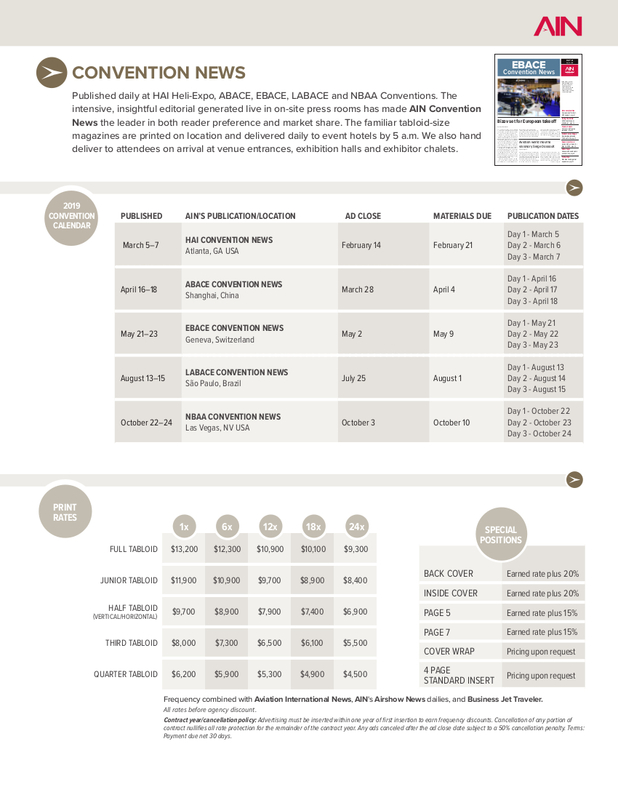 AIN will distribute 8,500 issues per day to over 40 hotels at the Singapore Airshow. AIN was the only aerospace news organization that provided video coverage at the 2016 Singapore Airshow. To date our video reports from the 2016 show have been viewed over 500,000 times. If only one publication covered the Farnborough Airshow, 42% would prefer AIN’s Farnborough Airshow News. Unmatched early morning distribution at 50-70 event hotels, transportation centers, airshow entrances, chalets and exhibit halls. Over 1,200,000 video views from our 2017 Paris Airshow Coverage. View our latest videos here. *2016 Farnborough Airshow Intercept Study. Full results here. 2018: Farnborough Airshow News - Farnborough, U.K. Since 2003 Business Jet Traveler and BJTonline.com have been helping private aviation end users and influencers maximize their investment in private lift. This 7x yearly magazine contains the need-to-know information that keeps our readers informed on their choices regarding private air travel. Reach this exclusive audience within BJT's pages. 81% of subscribers read half or more of each issue. A pass-along rate of 1.5 means a total audience of 90,473. 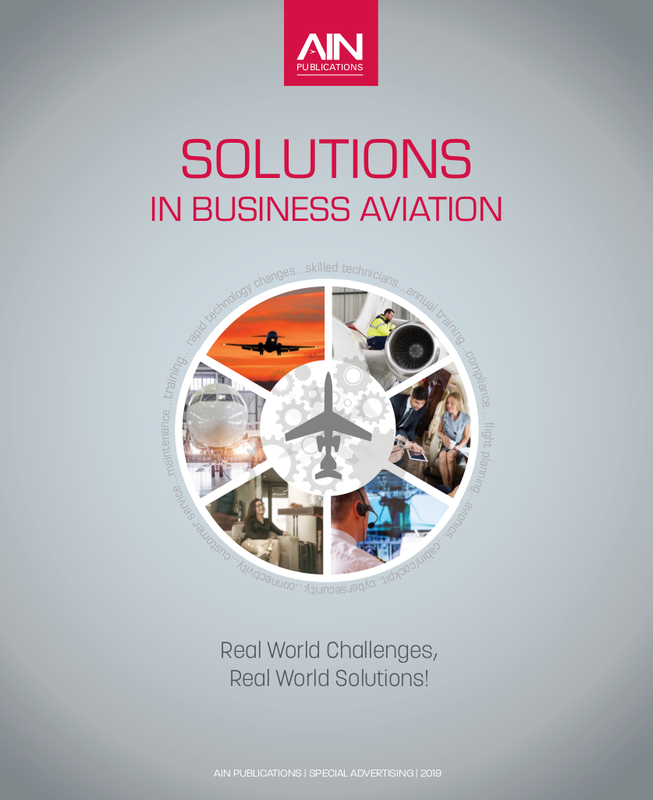 77% of BJT readers are involved in purchasing aviation products and services. The average BJT reader spends 42 nights per year in hotels at an average room rate of $326. BJT readers take an average of 44 flights per year (all types). 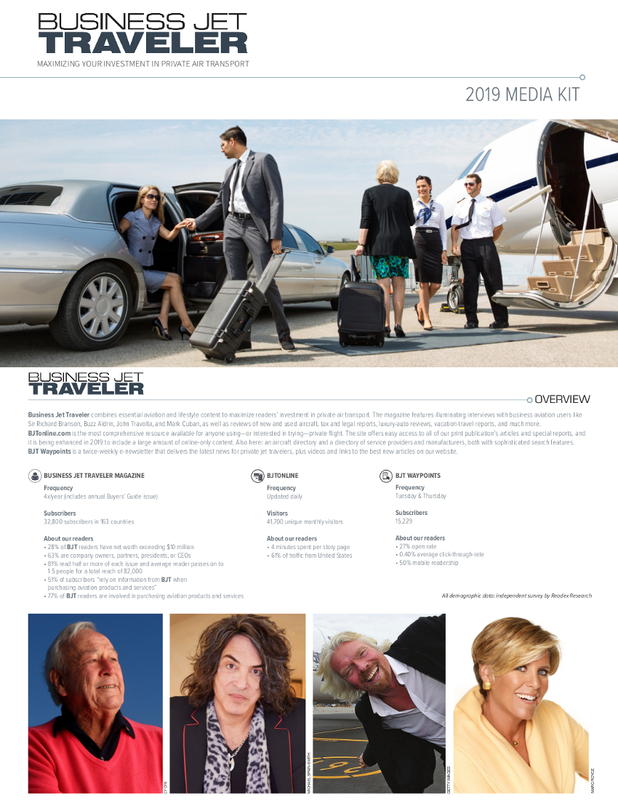 Learn more about Business Jet Traveler at BJTonline.com or in our Media Kit.